Note box on each page. Monthly expense section at the end of each month. Contains a minimum of 50% post-consumer recycled material. FSC® Certified. 7:00 a.m. to 7:30 p.m. in 1/2 hour intervals. Pink. 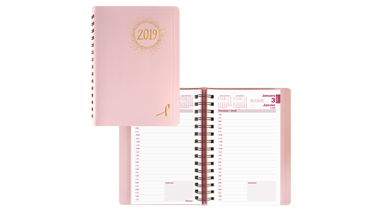 Blueline® is proud to have contributed over $900,000 to the Canadian Breast Cancer Foundation since 2007 from proceeds of the sale of Pink Ribbon products. Your purchase will help us surpass a goal of $40,000 for this year. Bilingual. 1 page per day. 8" x 5". Twin wire bound. Soft cover.